Ron Prince was hired at K-State in 2005 and coached the Wildcats for three seasons, going 17-20 during his tenure. He was fired in 2008 with three games remaining in the season. MANHATTAN — Kansas State has reached a settlement in its lawsuit against Ron Prince that will pay the former football coach $1.65 million, a lump sum Prince’s lawyers and agent say is better than what he was previously owed. The settlement ends a two-year process in which K-State attempted to bar Prince from receiving deferred payments of $3.2 million from a “secret agreement” between Prince and former athletic director Bob Krause in 2008, months before Prince was fired. Prince also received $1.2 million in buyout money from his regular contract. Neil Cornrich, Prince’s agent, said in a statement that Prince was “appreciative of KSU’s willingness to structure the settlement in such a favorable manner.” Cornrich contends the settlement is a “significant financial advantage” for Prince compared to the $3.2 million buyout. Those payments were not scheduled to start for almost five years and would not be fully paid until Dec. 31, 2020. The $1.65 million must be paid by May 25. K-State’s athletic department incurred a total of $395,000 in outside legal fees during this process. In a university release, athletics director John Currie said the settlement amount will be paid from conference and NCAA revenue and that no individual donations or ticket revenue will be used. The department will earmark K-State’s share of the withdrawal fees to be paid by Nebraska and Colorado to the Big 12 Conference toward fulfilling the settlement. “We are glad to close this chapter and focus our energies on building upon the terrific 2010-11 year Kansas State student-athletes have had both on the playing field and in the classroom,” Currie said in a statement. Both sides were to argue their cases in front of a jury beginning June 13 in Riley County District Court. The lawsuit began when K-State claimed Krause overstepped his bounds by negotiating a memorandum of understanding with Prince that contained the $3.2 million buyout. Former president Jon Wefald insisted the agreement was made without his knowledge and that Krause did not have the authority to make such a deal without his involvement. The agreement was inadvertently discovered by K-State in 2009, it said, and the university responded by launching a lawsuit seeking to invalidate the deal. Shultz said a part of the settlement includes a statement by K-State that clears Prince of any wrongdoing. It’s safe to say the case will be remembered for years. Not only was it a first-of-its-kind dispute, it led to a regime change within the athletic department. Putting all that behind it could have impacted the settlement on K-State’s end. “I think it’s a favorable outcome for Prince,” said Michael McCann, a Vermont law professor who also works as a legal analyst for Sports Illustrated. “For the school, there is a benefit to having closure to litigation. I don’t know what the value of that is, because it’s hard to quantify, but this lawsuit has attracted a lot of publicity that the school doesn’t want. Arguments made during a hearing for summary judgment last fall in Riley County District Court appeared to give Prince the advantage. “He probably had the stronger argument,” McCann said. “It seemed that the athletic director either had authority (to negotiate a coaching contract) or one could presume he had authority, and in either case Prince would likely win. 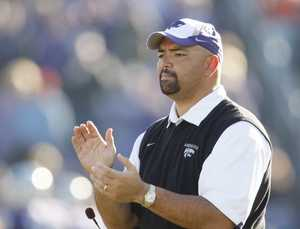 Prince was hired at K-State in 2005 and coached the Wildcats for three seasons, going 17-20 during his tenure. He was fired in 2008 with three games remaining in the season. Krause, who had already taken a new role at a K-State satellite campus in Olathe, resigned from his position when news of the second buyout with Prince became public. Wefald retired in 2009. Kirk Schulz took his place as K-State president, and John Currie followed Krause as athletic director. Prince is an assistant offensive line coach for the Indianapolis Colts.